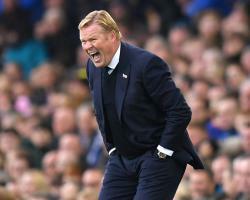 Everton defender Seamus Coleman snatched an 89th-minute equaliser to crush Swansea's hopes of a first league win since the opening day of the season. The Welsh club's long wait for three points goes on after Gylfi Sigurdsson's penalty was cancelled out after a late defensive lapse from Jordi Amat in the 1-1 draw at Goodison Park. As a result new manager Bob Bradley became the first Swans manager in the Premier League to fail to win in his first five games, having taken just two points since assuming control. And, if the American thought things could not get any worse, his side dropped to bottom place after Sunderland's victory over Hull. It was cruel on the visitors, who had limited a lacklustre Everton to few chances, but as the second half wore on they invited more pressure and their fragile confidence was eventually exposed. For 88 minutes it had all looked so much better as Sigurdsson's penalty capped an uncomfortable few days for Phil Jagielka, one of the players caught up in the furore of England team-mate Wayne Rooney's late-night drinking while on international duty, as he made the mistake which led to the visitors' breakthrough. Bradley made eight changes from the side which lost to Manchester United last time out, including South Korean Ki Sung-yueng, who suggested while on international duty the club was in "crisis". On that evidence they should have been the ones struggling to find rhythm against higher-placed opponents who made half the number of alterations, but they actually dominated possession after Romelu Lukaku's early half-chance. Sigurdsson looked dangerous both from set-pieces and open play, having one free-kick deflected over by the wall, with Amat heading wide from the resulting corner. The Iceland midfielder's value to the side cannot be under-estimated as, since joining Swansea, he has scored or assisted 37 of their 99 Premier League goals. Operating as a false nine he often dropped deep to give Everton's centre-backs Jagielka and Ashley Williams, facing his former side for the first time, a number of decisions to make. The option which Jagielka took five minutes before half-time proved calamitous. Sigurdsson latched on to Modou Barrow's flick-on to burst into the area and, after he skipped past Jagielka and had Coleman in his sights, the veteran centre-back's clumsy challenge could produce only one outcome. The boos which rang out from home fans at the interval were partly because the decent chances Everton created in the first half were wasted. Lukaku, who had scored seven times in his previous nine league appearances, failed to react quick enough to Yannick Bolasie's cross, which he allowed to hit him and bounce over an open goal from three yards. Bolasie was also not free from blame after shooting too close to Lukasz Fabianski when put clean through by Lukaku for the chance of an equaliser. Ross Barkley, too, again failed to deliver, with some ordinary set-pieces compounded by bundling wide a shot on the turn with his weaker left foot, having nutmegged Federico Fernandez with his first touch. That the second half produced no better opportunities than what had gone before highlighted Everton's problems as Swansea, sensing a long-awaited and much-needed three points, dropped deeper and deeper, throwing everything at the ball in a scrappy but effective rearguard action. Just when they appeared to have held out, Amat's weak header dropped to Coleman, who nodded a looping effort back past Fabianski's reach.